(CN) – Hurricane Maria evacuees who have been living out of hotels since the storm ravaged Puerto Rico won an extension Tuesday in their bid to stave off eviction by the U.S. government. Led by Alian Asencio, the eight evacuees filed the suit here on June 30 — the day that they were set to lose funding that had been provided to them by the Federal Emergency Management Agency under the Transitional Shelter Assistance program since Hurricane Maria struck on Sept. 20, 2017. U.S. District Judge Timothy Hillman granted an initial restraining order that same afternoon and opted this morning to extend relief until July 24. The class challenging FEMA in Massachusetts are represented by the Los Angeles law firm Manatt, Phelps and Phillips; the Hector E. Pineiro Law Offices of Worcester, Massachusetts; and LatinaJustice PRLDEF in New York. Before issuing this extension, Hillman held a conference call with the parties on Monday. FEMA said Tuesday it was aware of Hillman’s order and would notify the hotels that the program has been extended. “Beyond that, FEMA will not comment on pending litigation,” the agency said in a statement. Hillman asked the attorneys to address the refusal by Puerto Rican Governor Ricardo Rossello to request third extension of the FEMA program. FEMA’s attorneys face a July 13 deadline to file their briefs, and attorneys for the evacuees must reply by July 18. Hillman expects to have a decision by July 23. Throughout Connecticut, there are 21 families who are receiving temporary shelter from FEMA. This number is down from an initial 200 Puerto Ricans, but advocates estimate that there are dozens of people crowding the homes of relatives or staying free of charge at churches. 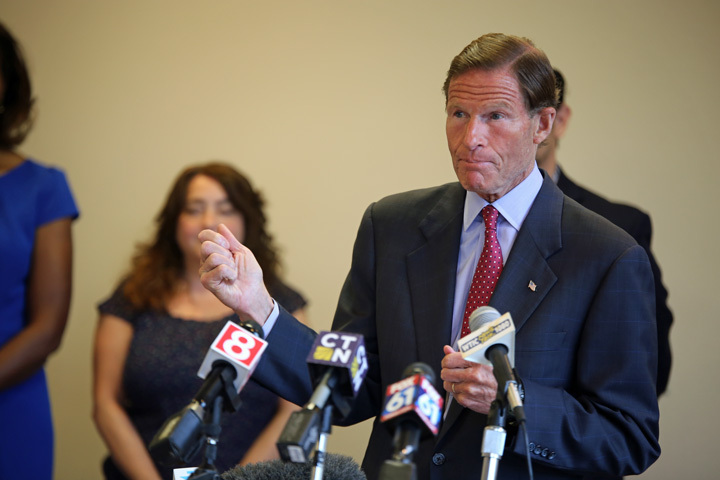 U.S. Sen. Richard Blumenthal of Connecticut held a press conference at the Red Roof Inn in downtown Hartford where some of the families are receiving temporary shelter. “We need the federal government to do what it has done in the wake of every other natural disaster,” Blumenthal said, recalling the the Disaster Housing Assistance Program that FEMA created with the Department of Housing and Urban Development after Hurricanes Katrina and Sandy. “Saying this program is unnecessary under these circumstances is an admission of abdication of responsibility,” Blumenthal added. He said there should have been HUD vouchers issued for the Disaster Housing Assistance Program. FEMA puts the number of families receiving housing assistance after Hurricane Maria at 962. Most are concentrated in Florida, New York and Massachusetts. At its peak the program was helping 7,000 families from the island.